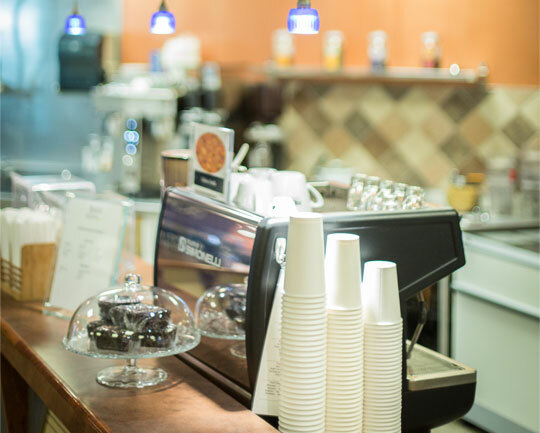 Juice & Java is our smoothie and coffee bar where members and non-members alike can come not only for healthy snacks and beverages, but also for a sense of community. Our friendly staff serve up a great atmosphere! Fifth Avenue Club members are offered the privilege of purchasing on a Juice & Java tab. We serve the finest selection of locally roasted Rosso Coffee Roasters and a variety of Smith teas. Your favourite espresso, specialty and brewed drinks are always available. Our fruit, protein and green smoothies offer a multitude of nutrients and antioxidants. We also offer a delicious variety of snacks, including fresh-made muffins, bagels, and more. Juice & Java is open Monday to Friday from 7 a.m. to 1:30 p.m. Whether it’s a quick pot of coffee for a meeting or a treat of fresh homemade muffins for the office, we offer a variety of catering options.